Break up cookie dough into medium bowl. 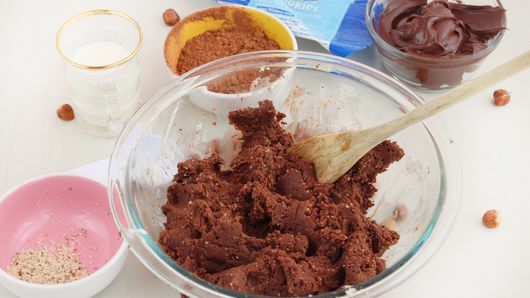 Add hazelnut flour, cocoa and whipping cream; mix with wooden spoon until well combined and chocolate dough is formed. Shape dough with hands into 30 balls. In ungreased shallow baking pan, spread hazelnuts. Add dough balls to pan; shake pan until all dough balls are covered with hazelnuts. 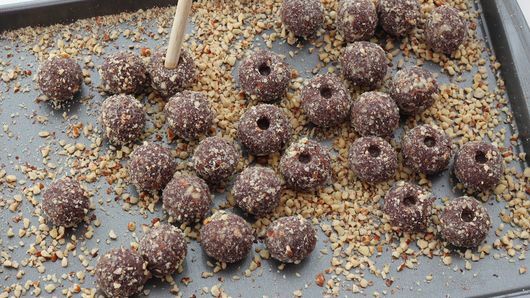 If desired, once dough balls are covered with hazelnuts, roll balls again in hands, gently pressing hazelnut pieces in dough. With handle of wooden spoon, make small indentation in each dough ball. Refrigerate pan with dough balls 30 minutes. Meanwhile, heat oven to 350°F. Line cookie sheet with cooking parchment paper. Remove pan with dough balls from refrigerator. Place cold dough balls on paper-lined cookie sheet. Remove cookies from cookie sheet to cooling racks. Cool completely. Place hazelnut spread in decorating bag with star tip. Pipe a little bit of spread on top of each cookie. If you don’t have hazelnut flour, place hazelnuts in a food processor and pulse until very finely chopped. 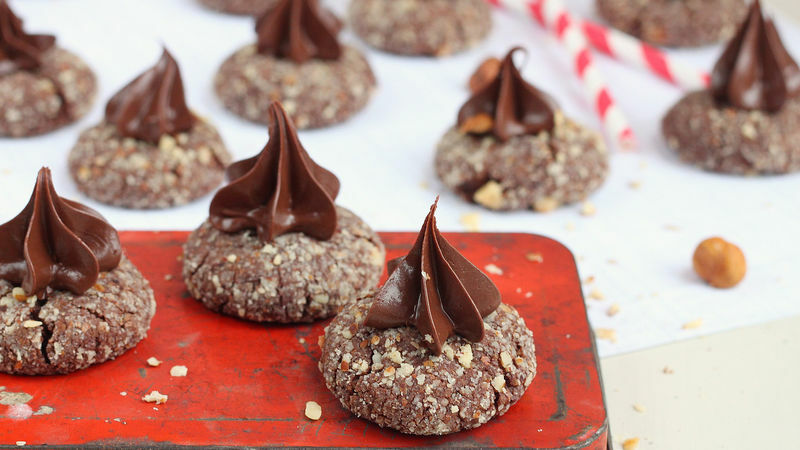 Place the hazelnut spread in the refrigerator before using it and the heat from your hands will soften it while piping on top of the cookies.